If you're going to cook for yourself you really need to be aware of the importance of keeping your kitchen clean and germ-free. You can pick up some very nasty bugs from unhygienic surfaces or from the food itself. Contrary to popular belief, it's not always the obvious things like undercooked meat that can have you hugging the toilet bowl for days - there are many other culprits. You certainly won't endear yourself to your new housemates if you give them all food poisoning during the first week. Although it sounds obvious, make sure you keep your kitchen clean. This doesn't mean you have to be up at sunrise every morning with your marigolds and Brillo pads but it does mean wiping surfaces, keeping the hob clean, emptying bins before they overflow and not leaving the washing up until there's not a clean cup or plate left. To make it fair you should really try and organise a cleaning rota (and this goes for the whole house, not just the kitchen). There's always someone who will try and get out of their share of the housework but at least with a rota if something isn't done you'll know who to blame! 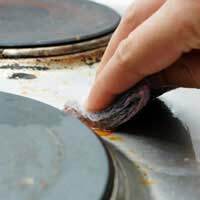 There's nothing worse than trying to cook a meal in a messy or dirty kitchen and it only takes a few minutes a day to keep it clean, rather than hours if grease and grime is left to fester. Rodents are the bane of many a student house. They will often be an inherited problem and therefore won't necessarily reflect on your cleanliness but once they're comfortable and have invited all their friends and relatives to stay, they're very difficult to get rid of. If you do have mice you need to keep all food covered, make sure all surfaces are free from food and take out the bins every day. If you don't have them, then don't encourage them by not doing any of the above. You can buy humane mouse-traps but if there's a real infestation, you'll have to call in the professionals. In the first instance, you should inform your landlord as it's their responsibility to deal with the problem. It's not always obvious when you have mice so you need to look out for signs: mysterious holes in cereal boxes and small black droppings, which are about the same size and shape as grains of rice. Here are a few tips to help you avoid a bout of food poisoning. Always wash your hands before you start preparing a meal and again after handling any raw meat. Store leftover, cooked food in the fridge and eat it within two days. When reheating it, make sure it's piping hot all the way through. Empty and clean out the fridge periodically - throw away half-used jars of sauces if you aren't sure when they were opened. Wash your tea towels regularly as they are a prime breeding ground for nasty bacteria. These are just some of the basic rules for enjoying a healthy time in your student kitchen. A lot of it comes down to common sense, so if you're not sure about a food you should just throw it away. This has to be the most vaccuos web page I have experienced in a long time. To make matters worse there is no way to seek clarifcation if needed. I give you "Don't reheat things that have been frozen" for an example. I don't think that is mean to be as all inclusive as it sounds and there is no way to resolve this matter. If you're only using this material to feed your students' brains you either won't retain the students very long or they're useless to you because they've shrunk tighter than a mummies rap. Very useful infomation I love it!